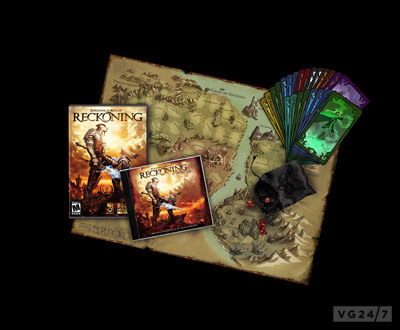 EA has announced limited editions from 38 Studios and Big Huge Games’ RPG, Kingdoms of Amalur: Reckoning. The sets range in price from the expected, to the expensive, with all three including a custom parchment map of Amalur, a seven-piece die set, and Destiny Cards. 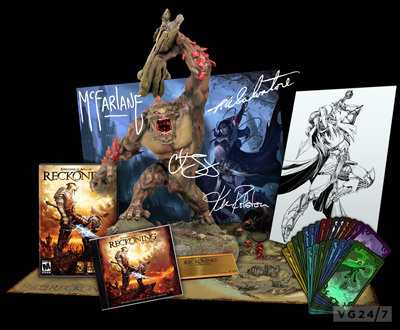 The Collector’s Edition and Signature Edition features select items created and signed by Todd McFarlane and Ken Rolston. Individually numbered Prismere Troll figurine created by McFarlane toys. The solid resin troll stands at 12.5″ and normally retails for $125. High-quality concept art lithograph from Reckoning limited to 1,000 units, signed by game visionary, Ken Rolston. Each edition is available for pre-order through here in North America only for a limited time. Shots of each are also posted below – sorry they’re so small. We’ll ask about UK and European editions for the rest of you.